Since 2001, Party Poker has provided the very best in iGaming products for players located all around the world, with the majority of their users located in Europe. In 2013, the company gained permission in the state of New Jersey to provide its residents with legal online poker options, which of course marks the first time Party Poker has been allowed to run its software in the United States since 2005’s UIGEA bill forced them to withdraw from the country. Party Poker NJ currently is licensed and regulated with the New Jersey Division of Gaming Enforcement and offers both poker and casino gaming to anyone located within the borders of the state. Because the brand is well-known, the site stays busy and is currently one of the most popular online poker options within New Jersey. Visitors coming to the state can also play on the site during the duration of their visit, but will be unable to access the site once they leave the New Jersey area. FREE $25 credited to your account upon signup (NJ residents only). Amazing software and graphics; app also available for iOS and Android. Real money poker traffic is limited to NJ residents only. Not as many cash games going as other rivals NJ (ie WSOP.com). As a new player of Party Poker, you will have instant access to quality bonuses and promotions. Party takes care of their members and starts from the very beginning to offer bonuses and free cash to help you build a solid bankroll. Take advantage of the $25 Free Bonus or the $1,000 New Player Bonus as you get to know the online poker site. The first option offered by Party Poker NJ is the $25 Free promotion. Party is essentially giving you free cash to be used for either poker or casino play. Use $10 in free cash for the poker cash tables and the additional $10 is given for casino games such as slots. You will also be given $5 which can be used in the ‘Big Money’ tournaments. Once you have signed up for your new account – and your personal info is verified – you will be credited the $25 to use on the games listed above. The welcome bonus at Party Poker NJ is quite generous, with a 100% match worth up to $1,000. Simply make a deposit and the online poker room will match that amount, up to $1,000. You will see the bonus cash deposited into your player account in 10 equal parts as you take part in real money games and earn points for your play. You will need to earn 4 points to clear $1 bonus dollar in the poker room, while 8 points during casino game play will unlock $1 in bonus cash as well. Because you are a member of Party Poker, you are automatically enrolled into their VIP program and will start earning loyalty point right away. Simply earn points as you play poker or casino games and see your loyalty level move up along the way. You can use these points to gain access to tournament tickets and cash via the points store. Players will earn 2 points for every $1 you spend on tournament fees or table charges at the poker tables. At the casino, you can earn points as well, with those being earned when you play real money slots, video poker, roulette and live dealer gaming. There are four loyalty levels at Party Poker NJ. The first is the Bronze level which offers a maximum value of 6.7% with $5 in tournament tickets. Silver offers a maximum value of 15.4% with $215 in tournament tickets offered. Zero points are required for the Bronze level while Silver requires 50 points a month. Move up to the Gold level once you have earned 750 points, with a maximum value of 20.5%, with $215 in tournament tickets and as much as $200 in cash rewards provided. The final level is Palladium, which requires 2,000 points each month, has a max value of 30.7%, offers $215 in tournament tickets and as much as $500 in cash rewards. The gaming software at Party Poker NJ is provided by bwin.party, which offers users three different ways to play. Choose Instant Play to have access to gaming immediately, with capabilities for Windows, Mac and Linux. Choose the download version, offered for Mac and Windows, with a fast and stable gaming experience. You also have access to Party’s amazing software on your tablet or smartphone by downloading the free app they offer in the App Store and Android Marketplace. Party’s software is some of the very best in the business, especially in terms of graphics and ease of game play. You are able to view and filter out cash games, tournaments and more from the lobby, as well as be able to choose table stakes and limits for each. Choose to use the 1 Click Lobby feature to access to your favorite games in just one click. As far as game play, you can track your hand history with the special features of the software, including watching previous hands with the hand history replayer. Look at your gaming history to see how you could have made a different choice to enhance your game play or simply check your player notes that automatically save and carry over to your next session. 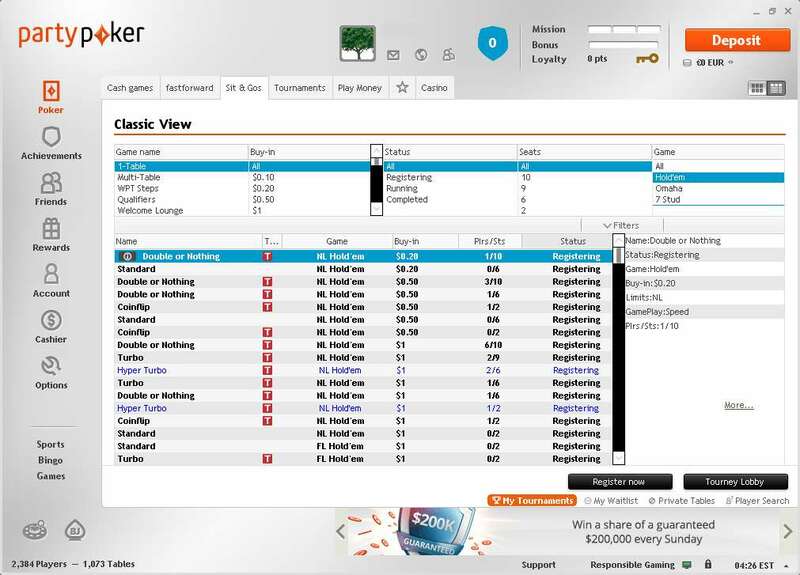 Customization options are great at Party Poker NJ, with options for custom avatars, bet sizing, different table skin selection and great multi-tabling features. 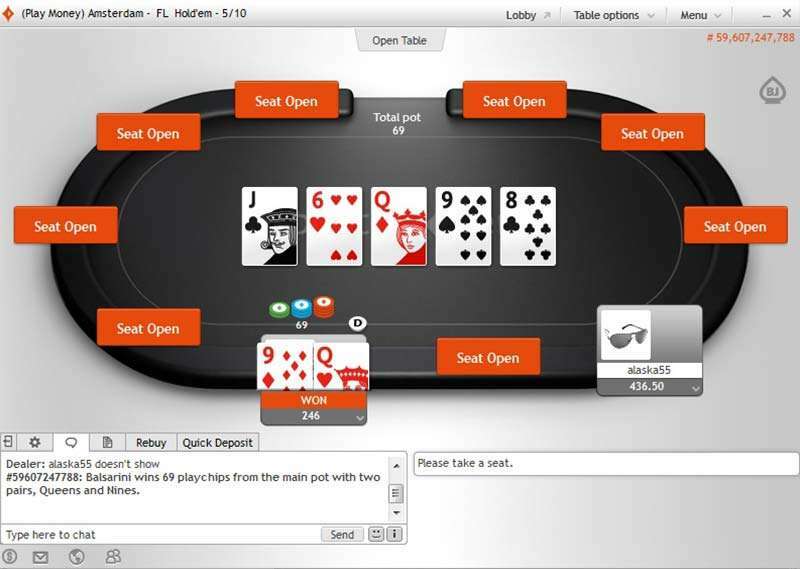 Players can open new tables and manage game play with the choice of either cascading or tiling the tables across the screen. The software can even detect if you are using two screens to provide you with better visuals during your cash game sessions. Like other popular online poker sites like Bovada and Carbon Poker, Party is gearing their business towards more recreational play and not so much professional play. This means that they are not allowing third party software to be used to track statistics during table games as it can give an unfair advantage to more seasoned players. There are no immediate plans to change their stance on this. 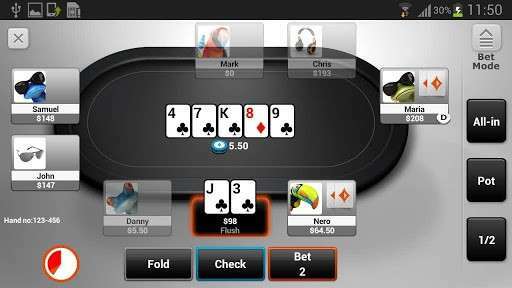 When you want to take your online poker action on the go, consider downloading the app on your mobile device. Party Poker NJ’s app is compatible with iOS and Android devices, which allows you to stay connected to the software and your account on the go. Texas Hold’em, Omaha and Stud are the most popular poker variants found at Party NJ. These gams are available at ring games, SNGs and MTTs. Other games include Limit 7 Stud, although the traffic at these tables is little to non-existent most days. Stakes range from $0.01/$0.02 to $10/$20 limits, with some of those being bumped up depending on traffic and availability. Players will discover the most popular option is the 6-Max NLHE tables, which have as many as 40 to 45 real money games running at one time. Tournaments are also popular at Party with their weekday majors, weekend guarantees, qualifiers for major events and more. The guaranteed events offer prize pools from $500 to $50,000. Party is one of the more popular sites offered in New Jersey, so it sees good numbers in regards to traffic. Players will find over 300 real money ring game players during 24-hour peak times while the 7-day average is around 140 users playing at any one time. With over 160 casino games, the Party Poker Casino NJ offers a nice break from poker gaming when you wish to enjoy table games, slots and video poker. Sign up for the casino and you will have access to quality promotions including the First Deposit Bonus worth up to $100 with 50 free spins included! When you wish to make a withdrawal at Party, you will have six options to do so. Taking the longest is the Instant e-check and check by mail. The e-check will take four to eight business days while the mailed check can take a week or more. Players can also use Neteller or Skrill to withdraw, which takes only 24 to 72 hours to clear your account. 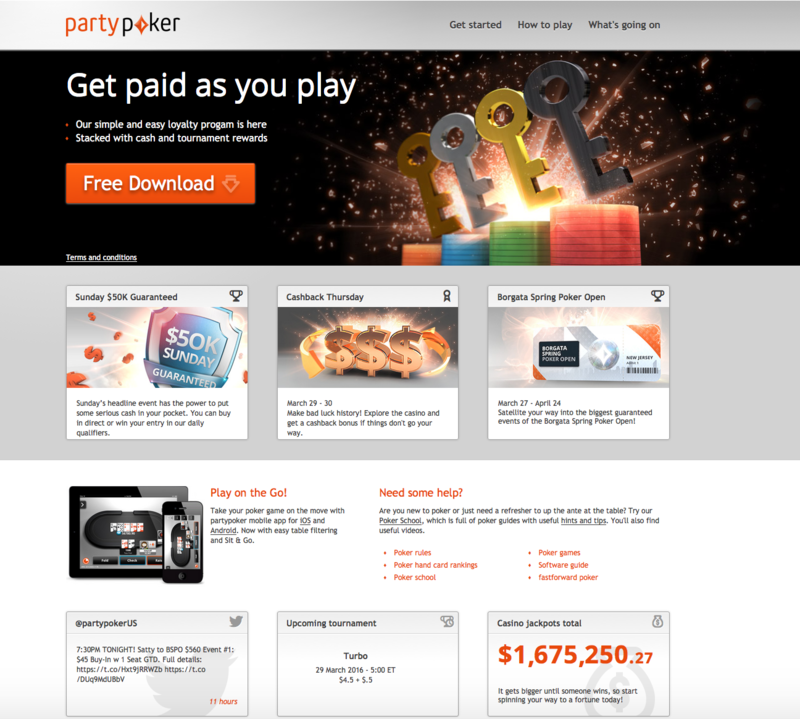 There is also the PartyPoker PrePaid Card that allows players to get their cash in just 2 to 6 hours! There’s also the more formal option of using the casino cage at the Borgata for a withdrawal within a 15-minute time frame after approval from the website. Customer support at Party Poker NJ is offered 24/7 with Live Chat, email and telephone access. Use the Live Chat on the site to get an even faster response. You can also write [email protected] via email or call their support line at 1-877-448-5831 to talk to a live agent.